“One Million Bones,” Histories of the National Mall, accessed April 22, 2019, http://mallhistory.org/items/show/443. 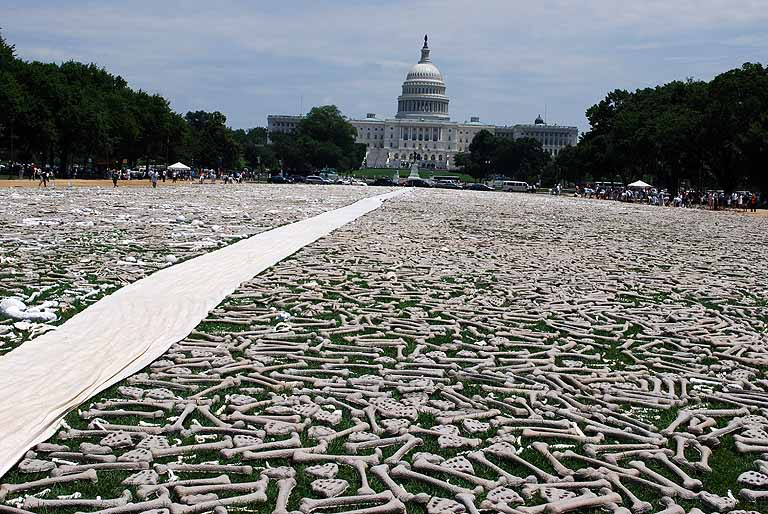 The Art of Revolution, a group who uses symbolic events to spark political action and social change, staged the "One Million Bones" exhibit on the National Mall June 8-10, 2013. This event laid out one million handcrafted "bones" on the central green space of the Mall. These bones were created by students, educators, artists, and volunteers from across the country. The event was a call to action against genocide in such places as Sudan, South Sudan, the Democratic Republic of Congo, Burma, Somalia, and Syria.